A look at the history and elements of Shingle Style homes, and the plethora of historic Shingle Style Cottages located on and around Mount Desert Island, ME. 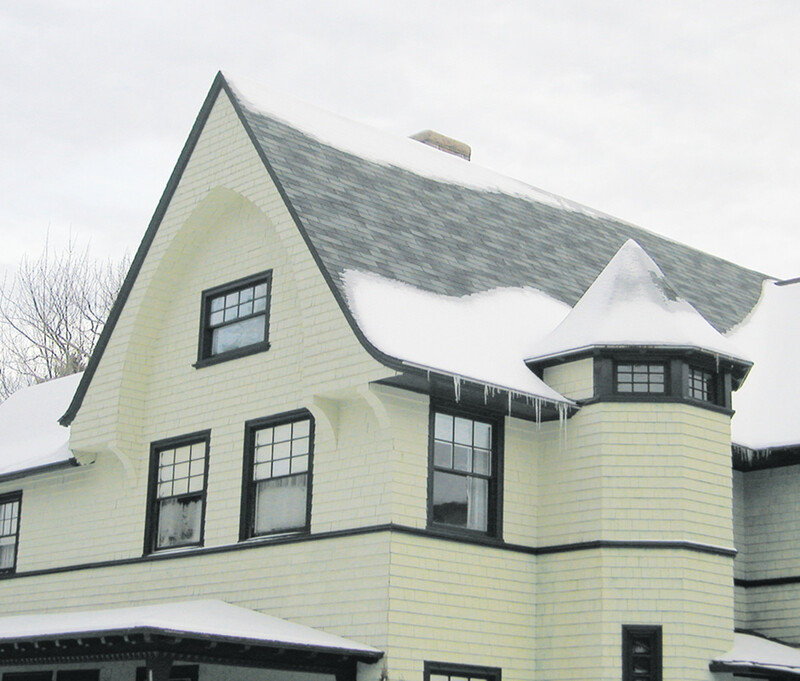 By the early 1880s, a sea-change in New England architecture had occurred. Catalyzed by the American Centennial, leading architects eschewed the by-then well-worn European motifs of the Greek Revival, Second Empire and Italianate and gave a lingering glance backwards to the first decades of Colonial America. 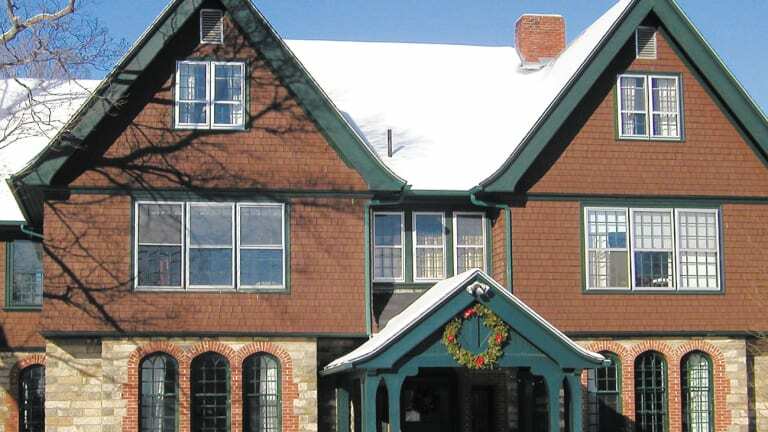 Some of the distinctive design motifs of the Shingle style are its compact fenestration and concealment of structural elements such as corbels and buttresses. 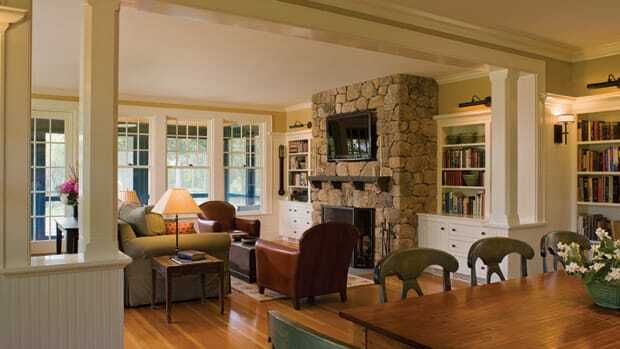 This Bar Harbor home features these, along with a distinctive arched, shingled gable. During this time, these architects drew inspiration from the distinctive materials and forms of 17th-century homes that still remained from the Massachusetts Bay Colony, also known as “The Old Colony.” Based upon English designs brought over by the passengers of the Mayflower and subsequent ships, these new buildings emulated the originals’ broad, overhanging gables, diminutive, diamond-paned windows and hand-spilt shingle siding. This was the first architectural foray into what was to become the Colonial Revival, and it coincided with the beginning of the historic preservation movement in this country, as a growing number of voices called out to save the ever-dwindling number of Pilgrim Century structures. 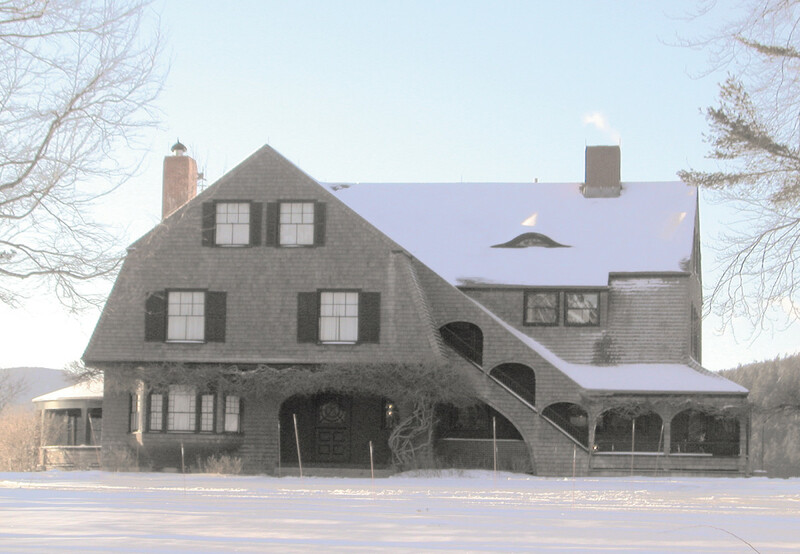 In 1955, Yale professor Vincent Scully anointed these 1880-90s buildings with the sobriquet “Shingle Style” and proclaimed a Boston architect named William Ralph Emerson, who lived from 1833-1917, as the style’s originator. Before the late 1870s, Emerson’s work was higher-caliber commissions in the Boston area. His 1879 breakthrough house, “Redwood,” located in Bar Harbor, ME, executed, as Roger G. Reed’s A Delight to All Who Know It, puts it, “the act that the exterior is fully shingled from roof to just above grade level. For this reason, the architect is credited for ‘inventing’ the Shingle Style.” Reed goes on to point out that the concept of sheathing the entire structure with shakes was hardly a one-off for Emerson; he produced a profusion of designs in this manner throughout the 1880s, revealing innovations and concepts that we think of as commonplace today. 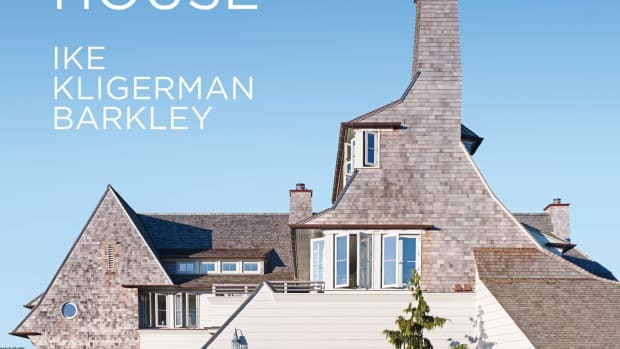 The revolutionary aspect of the Shingle style was much greater than its exterior finish materials; it introduced an organicism to a building’s overall structure and an emphasis on its horizontal planes. These new-style homes melded into their physical surroundings, and, instead of being a palace imposed upon a plain, they embraced the site upon which they were built, creating a much softer transition from natural to built environment. Roof lines varied greatly in pitch and angle, and axis of additional wings and porches could be anything but 90 degrees: the precise symmetry and formality of Classicism experienced a wholesale rejection. In sum, the Shingle style was as conscious of its location as it was of the structure itself. 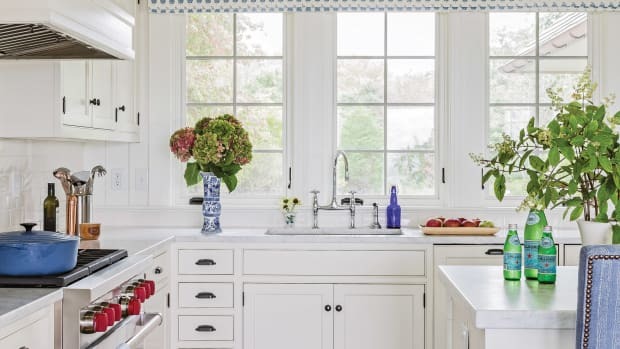 The Shingle style also ushered in radical change in the layout of interiors as well. Suddenly, the time-honored symmetrical arrangement of rooms on either side of a central hall was replaced with an almost random and irregular floor-plan. Inglenooks, corner fireplaces and staggered flights of stairs concealed with spindled screens created a cozy and informal atmosphere, even in the grandest of homes. 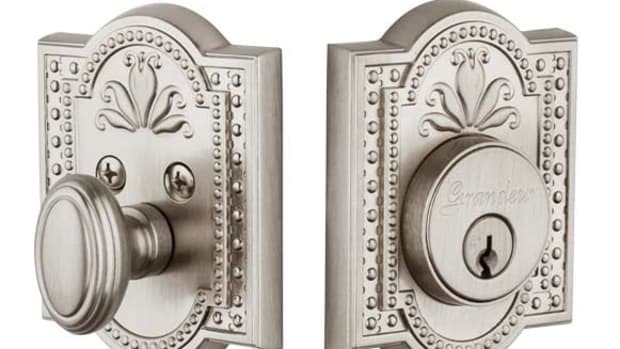 This modern approach to interiors was the product of Charles Locke Eastlake and the English Medieval revival coupled with the asymmetry fueled by the Japan craze of the late 1870s and 1880s, again rejecting the tenets of Classical design. Emerson, at the forefront of this radically new style, created a large number of summer “cottages” for the wealthy. Many were located on and around Mount Desert Island, ME, and, more properly, in the prestigious towns of Bar Harbor and Northeast Harbor. Geographically, the island’s rocky, undulating coastline lent itself perfectly to houses nestled in amongst the pines and boulders. Much of Emerson’s work has not survived; one of his grander works, Mossley Hall, is a sprawling summer estate. Note the carriage pass-through and the integration of the porches inside the footprint of the house. While massive, the structure still blends the built and natural environments. Emerson’s grandest Bar Harbor commissions, Mossley Hall and Beau Desert, reveal a rugged, flinty interpretation of the style, an acknowledgement that even in the warmth of mid-summer, the cold blasts of winter were just around the next harbor. While these buildings sprawl and sport multifaceted gables and playful ornament, one is struck that there is still an awareness of their northern latitude. Many times, porches and piazzas are “inside” the footprint of the main structure, which is the antithesis of the open porches of warmer climes and their desire for constant cross-ventilation. They are hardly modest dwellings; Beau Desert had 12 separate methods of egress on the first floor, and both homes possessed large wings that were connected to the main structure by long carriage pass-throughs topped with second-story passageways. They were, like many of Emerson’s finer works, solid in feel, no matter how fanciful their trim or roofline. The ecclesiastical structures of Mt. Desert, both by Emerson and others, offer some of the more unique details of the Shingle style indigenous to the island. The humble St. Jude’s chapel in Seal Harbor reveals Emerson’s exquisite attention to detail; the graceful eyebrow window serves in lieu of a lunette and the shingled buttresses blend seamlessly while performing their necessary function. The tiny squared panes on all the fenestration show a fine attention to detail and nod to the smaller window sizes of the Colonial era while adding a modern (for the period) rendering. A larger chapel in Northeast Harbor boldly embraces medievalism; its gray slate roof glints armor-like, and its hip roof is transformed into a deeply hooded semicircular helmet supported by a profusion of corbels and tiny diamond-pane windows. The entire building is supported by a rough-hewn brownstone foundation that forms a Romanesque entry arch. While one seldom hears the word “imposing” used in conjunction with “chapel,” the structure at first glance might be mistaken for an armory if it weren’t for its scenic location amongst the white pines. This Northeast Harbor home features a unique approach to an exterior staircase. The ascending shingled arches, supported by a grander, flying arch merge brilliantly with the porch. In Bar Harbor center, Saint Savior’s Church and Rectory pay tribute to Gothicism, as the pointed brick arches of the rectory’s windows and ashlar walls of its first story support the second and third, which are sheltered with the ubiquitous flared verge-boards of the Shingle style. It is the church proper where the Gothic influence is integral to the design of the structure; the gable end of the main sanctuary is a case study in the geometry and motifs of things Gothic: the lines of the gable form an equilateral triangle, and the round rose window is framed with a paneled and timbered Gothic arch. The entire roof massing is supported by regularly spaced rough-hewn stone buttresses that combine a soaring roof-line while remaining thoroughly grounded. The tower at the far end is shingled with small, fortress-like windows derived from some winding cathedral stairwell. 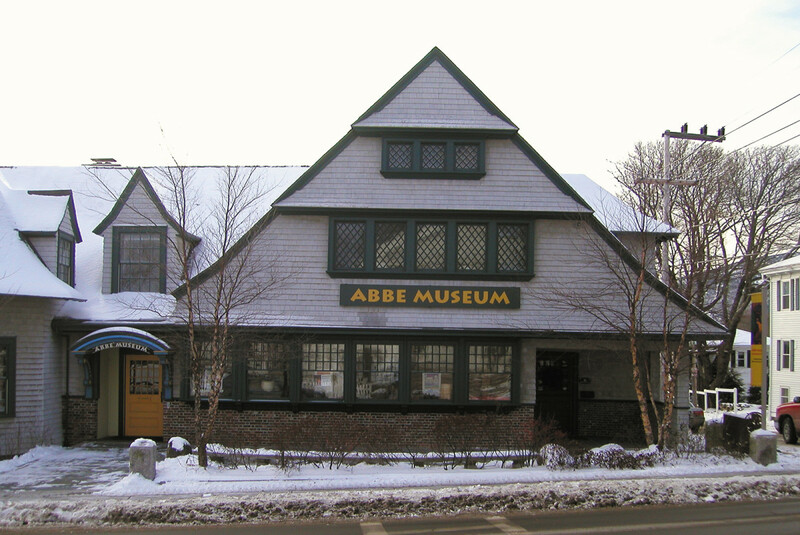 The façade of the Abbe Museum in Bar Harbor provides a direct link to the New England architecture of the 1640s, as evidenced by its broad-shingled gable and diamond-pane windows. Many other large homes throughout the area repeat the themes of the Mt. Desert Shingle style. The Abbe Museum, now home to a Native American Heritage museum, provides a direct link between the architecture of the 1640s and the 1880s. Its huge front-facing gable and proportionally small arrays of diamond panes are simply an updating of houses built near Boston centuries ago. As the Shingle style became more commonplace and interpreted by lesser hands, the resultant buildings are interchangeable with any of the more affluent streetcar suburbs of northeastern urban areas. 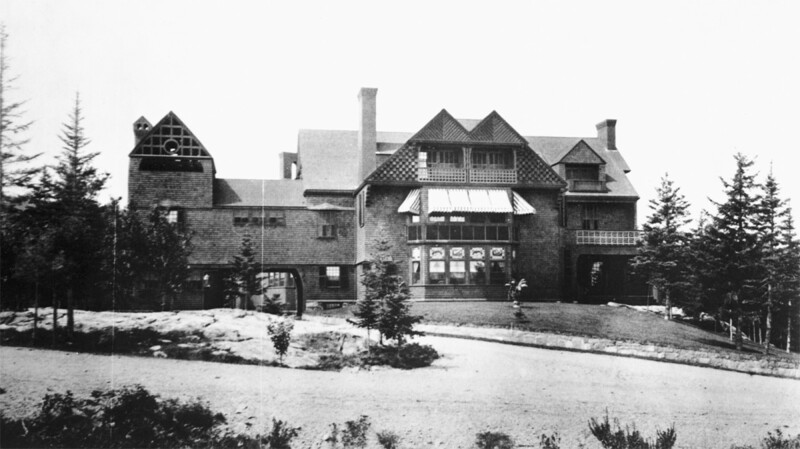 Many of the finest examples in Bar Harbor are no longer with us; the Depression forced many summer estates into disrepair or demolition for tax reasons, and worse, in 1947, a sweeping wildfire that lasted 10 days devastated the island, destroying 170 homes, including 64 on Millionaire’s row, along with five historic hotels. Today, many of the remaining houses are best viewed by water-craft, slinking from inlet to inlet, as choice real estate locations are oriented towards water views, and thus are concealed from the street by winding drives. To better understand the distinctiveness of the Mt. Desert aesthetic, it serves to contrast it with the more well-known buildings in Newport, RI, which is erroneously thought to be the cradle of the style. Some might say that the Rhode Island examples there lack a purity of style due to not only the topography, but affluence as well. Unlike the craggy Mt. Desert coastline, Bellevue Ave in Newport, is a straight, level boulevard that thrusts its architecture directly to the forefront, and although the Cliff Walk possesses it share of undulations and promontories, the landscape does not allow for the same sort of nestling found to the north; structures in Newport are invariably sited for their benefit, and the land concedes to them; on Mt. Desert, they frequently hunker down, joining the cascading boulders on their way to the sea. Newport clients gave stellar firms like McKim, Mead and White free reign, but the affluence therein and its attendant peer pressure to display wealth more often than not yielded an exuberant level of ornamentation. While the more notable Shingle-style homes of Newport such as Ochre Point and the William Watts Sherman House stand as iconic masterworks, their detailing, massing and locations lack the organicism of the Mt. Desert aesthetic; as brilliant as they are (and their importance in the pantheon of American architecture is indisputable), they are guilty of the architectural equivalent of keeping up with the Vanderbilts. Newport added that extra layer of detail and embellishment which elevated these homes to a glittering level that would seem ostentatious on a rocky cliff in Maine, committing the Down East variant of putting on airs. Even the Isaac Bell House with its bamboo porch columns has a nuance and delicacy that appears contrary to Emerson’s solid and robust forms. As the 1890s approached, the Shingle style could no longer ignore the American infatuation with Classicism, and where there once would have been shingled arches supporting a porch roof, columns with simple capitals appeared, and as the Colonial Revival swept the land, its hallmarks, such as Adamesque windows, entablatures and dentil moldings, found company with the graying cedar shakes. One of Emerson’s later and most spectacularly sited works, Felsted, was built in 1896 as the family cottage of renowned landscape architect Frederick Law Olmsted, Jr. Feldsted displays some of this evolution towards the Neoclassicism of the later Colonial Revival. The shingled arches are replaced by wood corbels and the porches are garnished with long, open spindled rails and balusters. More notably, the house, built into the side of a hill on the shore, has a full story foundation that is constructed of the same stone, making it appear as if built on a outcropping. 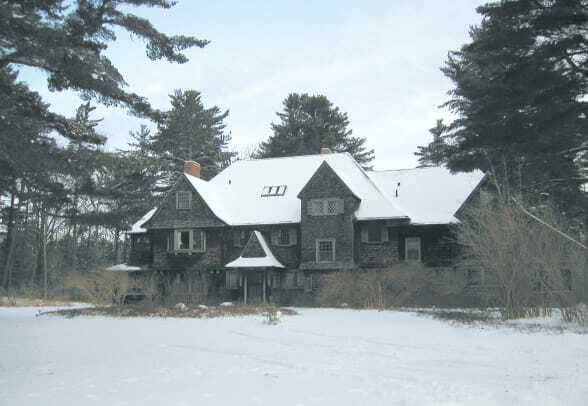 Emerson’s interpretation of the Shingle style often sited structures to become an integral part of their environment. This Northeast Harbor home is nestled securely amongst the rocks and pines of the waterfront. The Shingle style also appeared in most other seaside resort areas, from eastern Maine, through Newport and onto the tip of Long Island, at Montauk. One iconic example of the style, executed by Peabody and Stearns, is Kragsyde. Built in 1882 in Manchester-by-the-Sea, MA, it is a fanciful, complex structure that drew inspiration from storybook castles as much as 1640s Colonial America. Kragsyde’s spectacular Romanesque arch over the drive and whimsical minarets accentuated the romantic and quaint aspects of many a Shingle house, and is much in keeping with Emerson’s work. On a more innovative bent, McKim, Mead and White’s 1887 Low House in Bristol, RI, was essentially a large, shallow-pitched roof. As Richard Guy Wilson writes: “In the Low house, McKim gathered all the elements of the house and submerged them under a great triangular gable or pediment. The roof was the house. Slight eruptions occurred with the twin bulging bays on the bay side, and the deep penetration of the porch but overall the predetermined form was paramount.” The Low House is strikingly contemporary, and presages the reinterpretation of the Shingle style in the latter 20th century. Like Newport, Mt. Desert Island was a playground for the rich and famous in the late-19th century, with the likes of the Rockefellers and their peers summering there. Maine is not Newport; despite the wealth, things do not glitter there in the same manner, more mindful of their place between land and sea. 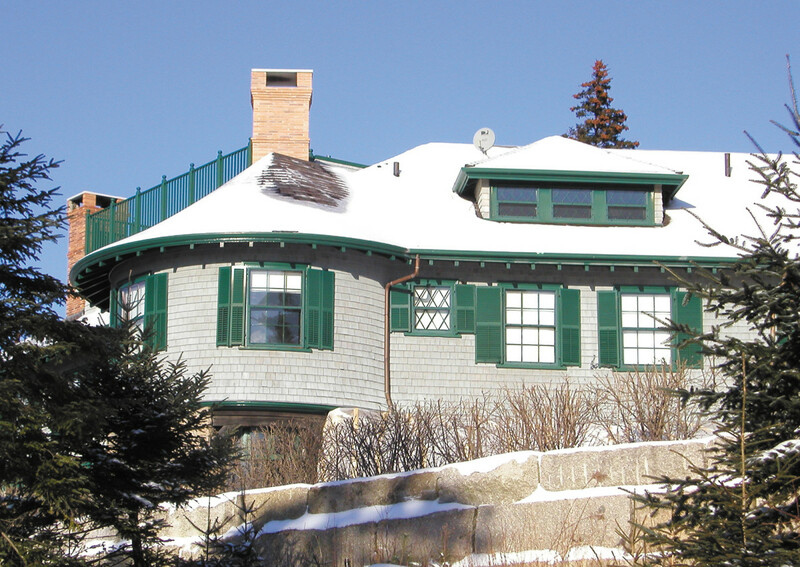 While some may argue that the most important examples lie to the south, it is in Bar Harbor and Northeast Harbor where the spirit of the Shingle style is to be found.